Over the past few decades, the population in the urban areas has been increasing in a dramatic manner. Currently, about 80% of the U.S. population and about 50% of the world’s population live in urban areas and the population growth rate for urban areas is estimated to be over one million people per week [1, 2]. By 2050, it has been predicted that 64% of people in the developing nations and 85% of people in the developed world would be living in urban areas [1, 2]. Such a dramatic population growth in urban areas has been placing demands on urban infrastructure like never before . S. E. Koonin, “Urban informatics: Putting big data to work in our cities [online],” http://data-informed.com/urban-informatics-putting-big-data-to-work-in-our-cities/, 2016. “NYU Center for Urban Science and Progress [online],” http://cusp.nyu.edu/urban-informatics/. 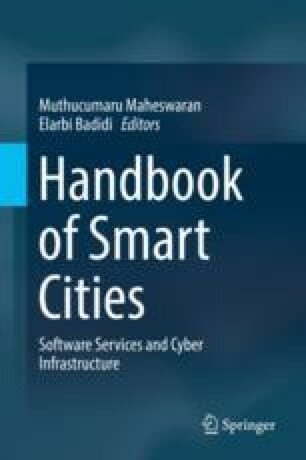 “Beyond smart cities - people first approach [online],” http://www.urbaninformatics.net/. “Wikipedia article on Urban Computing [online],” https://en.wikipedia.org/wiki/Urban_computing. “Waze traffic navigation app [online],” https://www.waze.com/en-GB/. “Smart waste management [online],” http://www.link-labs.com/smart-waste-management/. “Waste management using Enevo [online],” https://www.enevo.com/. “Waste management using SmartBin [online],” https://www.smartbin.com/. V. Slavov, A. Katib, P. Rao, S. Paturi, and D. Barenkala, “Fast processing of SPARQL queries on RDF quadruples,” in Proc. of WebDB ’14, 2014, pp. 1–6, https://arxiv.org/pdf/1506.01333v1.pdf. A. Katib, P. Rao, and V. Slavov, “A tool for efficiently processing SPARQL queries on RDF quads,” in Proc. of the 16th International Semantic Web Conference (ISWC 2017), Vienna, Austria, Oct. 2017, pp. 1–4, http://ceur-ws.org/Vol-1963/paper472.pdf.